I even got an old sheet down and made a toile. It came as a huge surprise to me when, after a bit of fiddling, it actually fitted. Like perfectly. I can’t remember that ever happening before. I usually go with close enough but this was the proverbial glove. Then came the fun of choosing fabrics. The lounge floor was a mess and nothing was safe from the Radiant Golden Age shears, not even Dad’s smooth striped business shirts. 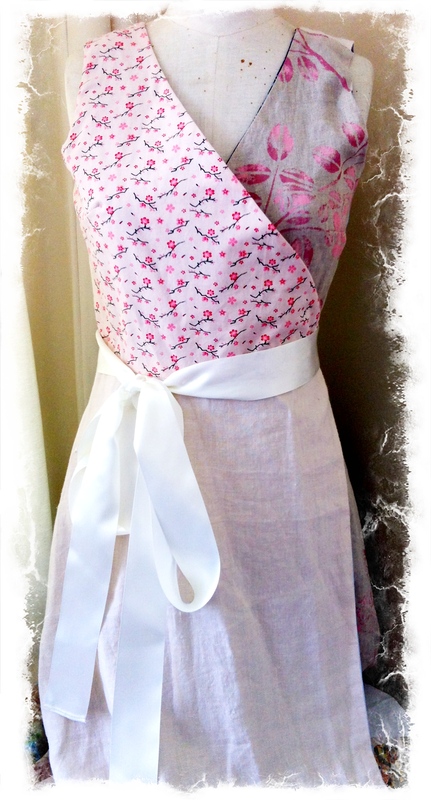 I made the wrap dress slowly, one side at a time, carefully weighing and measuring, draping and discarding. It was one of those projects where nothing went wrong. That hardly ever happens to me either. And at the end of day two I had not one new dress but six! 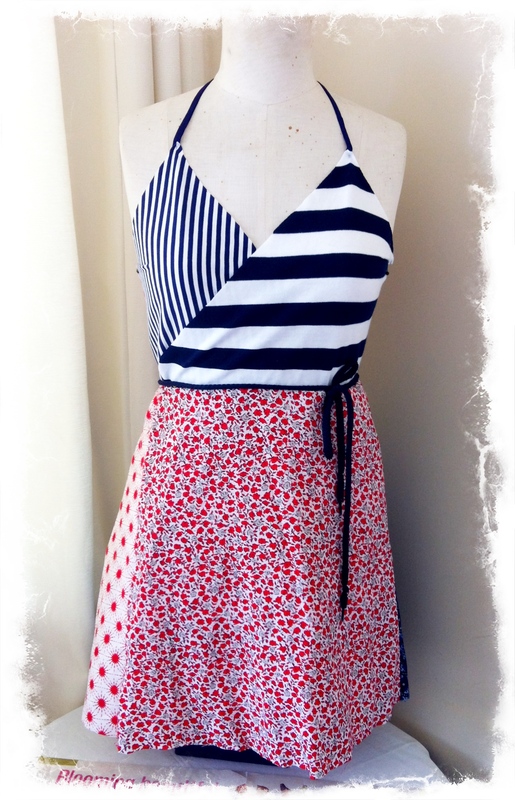 The dress is totally reversible, can wrap right over left AND left over right as well as be worn back to front. It’s simply magic. Here are three of my favourite combinations. A drapey rayon print and a bit of very light denim over a soft striped business shirt. The blue side of the dress worn back to front. 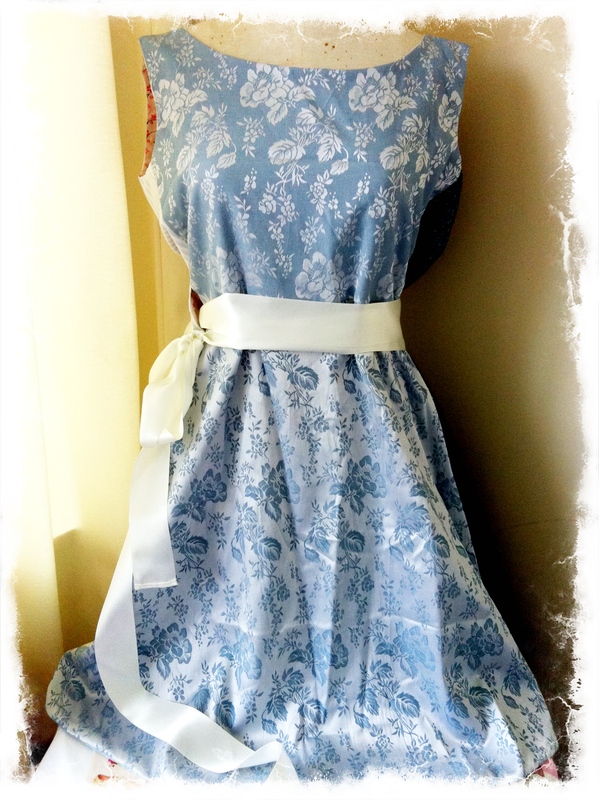 I made this from the vintage damask I found last week. I used one side of the fabric for the bodice and the other side for the skirt. I think I love this most of all. I love the red and blue combination she came up with. This wrap is a couple of stripey tee shirts, a floral polyester dress and a dotty remnant she found at the Sallies on Monday. The plan for the lining is just one fabric, a plain light denim. It’s so cute, just perfect for her! I love to look at Annah’s combinations online, especially all the frills and ruffly net she adds and after making my own take on this dress, I can see why it’s worth the asking price. Her dresses would be too fancy for me to wear to school but my one is going to be perfect. The dresses look great! I admired (and analysed) her dresses at a recent craft fair. You’ve gone the extra step and made them! Beautiful work. OMG, I love this! I have always like the Annah Stretton dresses, but refuse to pay the exorbitant amount for them. And I agree they are a bit flouncy at times, and need the right occasion, but yours is just perfect! Oh, I love those! I especially like the last one with the pink/blue/spots/stripes/floral. What a great project! Another inspiring project, your dresses look great. I’ve looked at these dresses at a craft fair as well and even took the brochure to study further but never got any further, maybe it’s time to have another look. I also hardly ever have things fall into place too. Not only that, they often don’t look that good if they do. So you are doubly lucky, or is that 6 times blessed? egads. blog ate my comment. poos. can’t remember what i just said. i blame the salt-tequila-lemon. ohk, you girls are so blimmin’ talented – love love LOVE what you’ve made!!!!!!!!!! totally exquisite – i needed you here to help with mine – talk about hair gone grey. i need to make friends with it again – it’s just that i carefully added lace around one of the hems, but because the skirt pieces are cut on the bias (and they’re lace too) the whole thing drops significantly at the back when i wear it. poos. Gorgeous!!!!! The pink one is perfection. They are all fabulous! Never in a million years would’ve thought of doing a wrap dress with different fabrics. Fun, thrifty and sooooo cute. I love the blue one, nice and fresh. 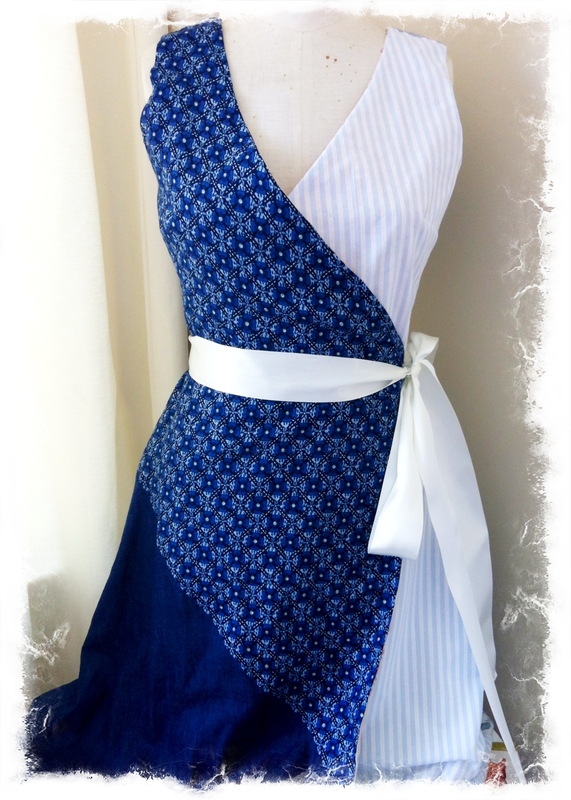 I have a few knit fabric wrap dresses and they always sit well, do you think that if I made a pattern of them, but used non-stretch woven cotton fabric, it would work? 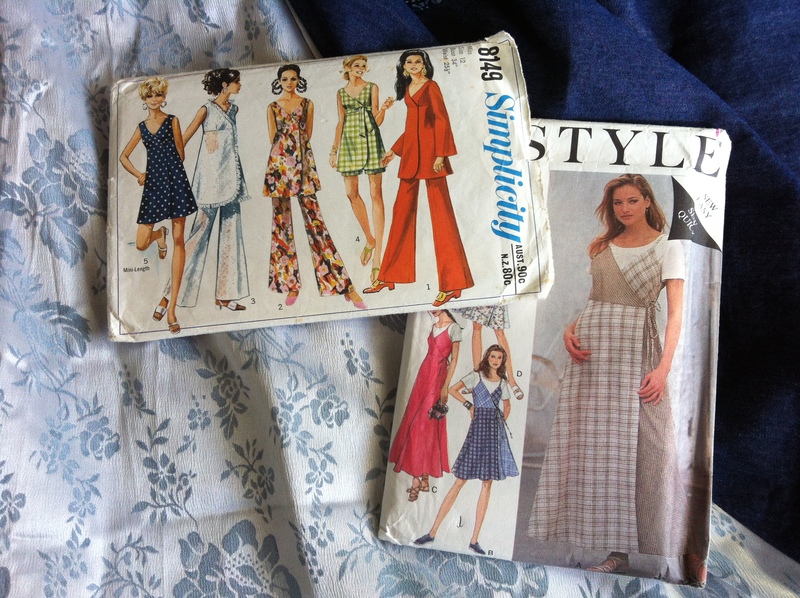 Then I could play with some vintage fabric combinations too. I’m not finding it easy to find a wrap dress pattern! Kicking myself for all the ones I’ve passed up over the years.